One day, Marty Belucci’s teacher gives the class an exciting assignment: they must write letters to famous people. 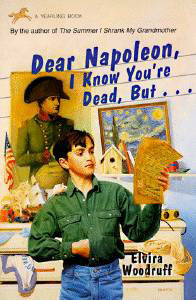 Marty decides to write to Napoleon, even though he’s dead, and the teacher objects. Then Gramps tells him about something strange and wonderful going on at the nursing home where he lives – a secret courier service that can deliver letters to people in other times and places. Gramps mails Marty’s letter, and several weeks later, a letter comes back – from Napoleon himself! More letters get exchanged between Marty and Lincoln, Marty and Edison, Marty and Van Gogh. The supernatural correspondence causes an uproar at Midbury Elementary. Are the letters real or did Marty forge them? Marty tries to find the secret courier service to prove the letters aren’t fake, in this upbeat, offbeat novel.